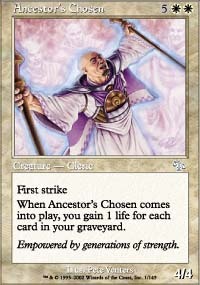 When Ancestor's Chosen comes into play, you gain one life for each card in your graveyard. 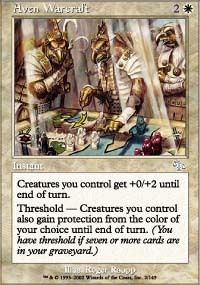 Threshold - Creatures you control also gain protection from the color of your choice until end of turn. 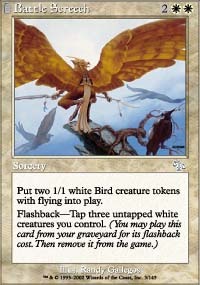 Put two 1/1 white Bird creature tokens with flying into play. 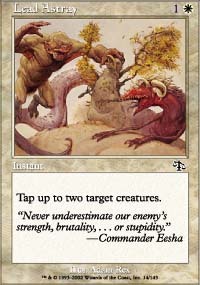 Flashback - Tap three untapped white creatures you control. My destiny is to save others so theirs destinies may be achieved. 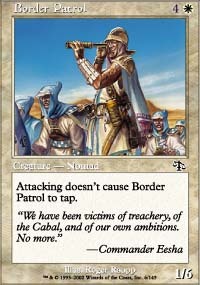 Attacking doesn't cause Border Patrol to tap. "We have been victims of treachery, of the Cabal, and of our own ambitions. No more." "Power often costs too high of a price." You gain life equal to its power. 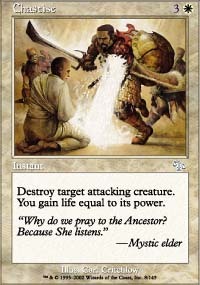 "Why do we pray to the Ancestor" Because She listens." 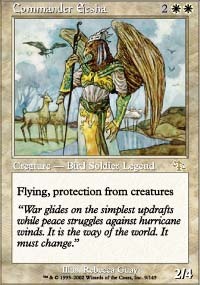 "War glides on the simplest updrafts while peace struggles against hurricane winds. It is the way of the world. It must change." 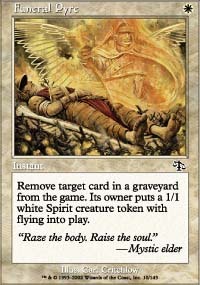 Remove target card in a graveyard from the game. 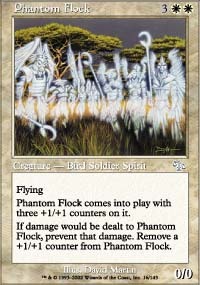 Its owner puts a 1/1 white Spirit token with flying into play. 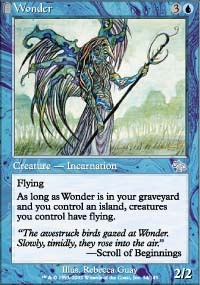 2W: Creatures you control gain protection from the color of your choice until end of turn. 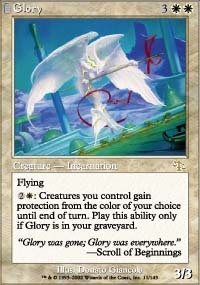 Play this ability only if Glory is in your graveyard. "Glory was gone; Glory was everywhere." Choose an artifact or enchantment you own from outside the game, reveal that card, and put it into your hand. 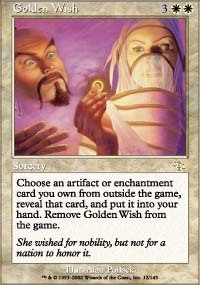 Remove Golden Wish from the game. "May the Ancestor strengthen my hand and guide my blade." "Never underestimate our enemy"s strength, brutality, " or stupidity." Nomads weave tales thicker than tapestries. 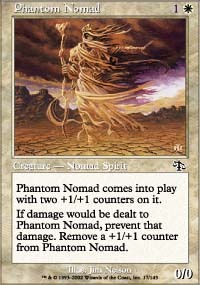 Phantom Nomad comes into play with two +1/+1 counters on it. 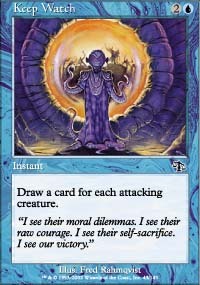 Prevent all damage that sources of the color of your choice would deal this turn. 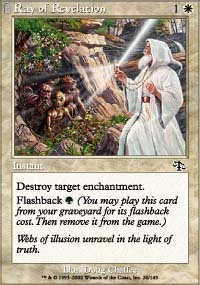 Flashback: Tap an untapped white creature you control. 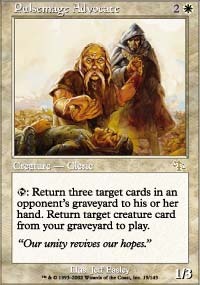 T: Return three target cards in an opponent's graveyard to his or her hand. 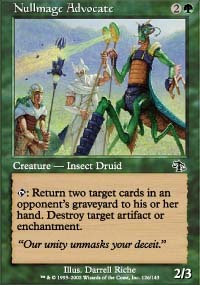 Return target creature card from your graveyard to play. Our unity revives our hopes. Webs of illusion unravel in the light of truth. 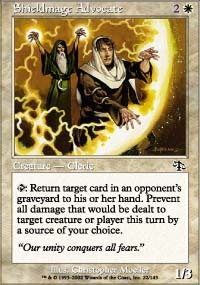 T: Return target card in an opponent's graveyard to his or her hand. 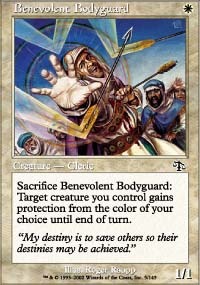 Prevent all damage that would be dealt to target creature or player this turn by a source of your choice. 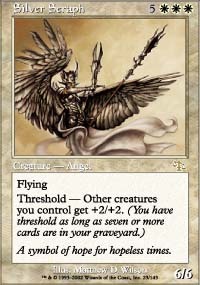 Threshold - All other creatures you control gain +2/+2. 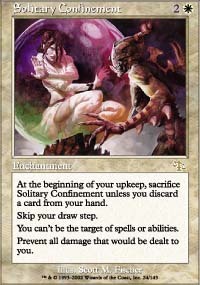 At the begining of your upkeep, sacrifice Solitary Confinement unless you discard a card from your hand. You can't be the target of spells or abilities. 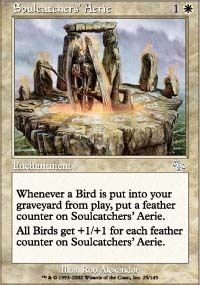 Whenever a Bird is put into your graveyard from play, put a feather counter on Soulcatcher's Aerie. 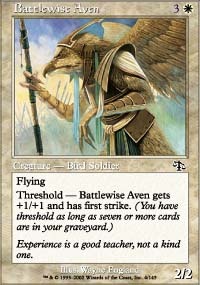 All Birds get +1/+1 for each Feather counter on Soulcatcher's Aerie. 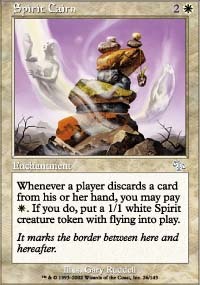 Whenever a player discards a card from his or her hand, you may pay W. If you do, put a 1/1 white Spirit creature token with flying into play. It marks the border between here and hereafter. 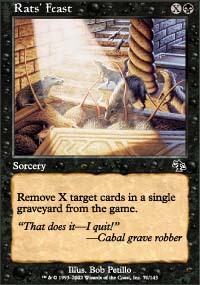 T: Return two target cards in an opponent's graveyard to his or her hand. 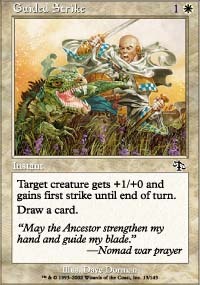 Destroy target attacking creature. 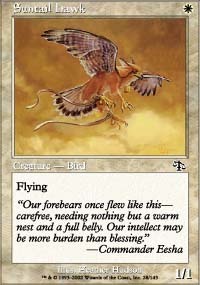 Our forebears once flew like this - carefree, needing nothing but a warm nest and a full belly. Our intellect may be more burden than blessing." 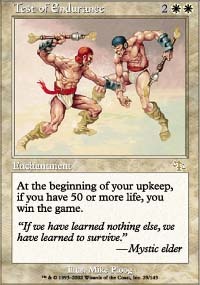 At the begining of your upkeep, if you have 50 or more life, you win the game. 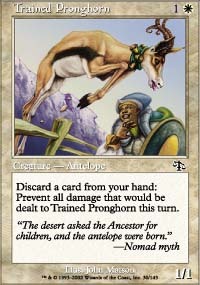 Discard a card from your hand: Prevent all damage that would be dealt to Trained Pronghorn until end of turn. "The desert asked the Ancestor for children, and the antelope were born." 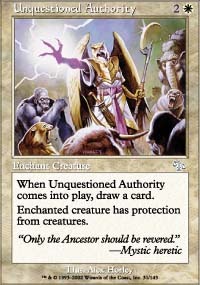 When Unquestioned Authority comes into play, draw a card. Enchanted creature has protection from creatures. "Only the Ancestor should be revered." 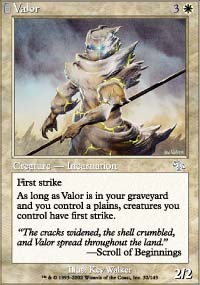 "The cracks widened, the shell crumbled, and Valor spread throught the land." 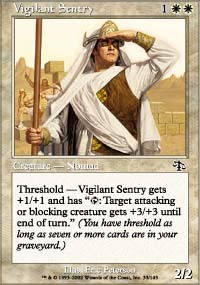 Threshold - Vigilant Sentry gets +1/+1 and gains "T:Target attacking or blocking creature gets +3/+3 until end of turn." 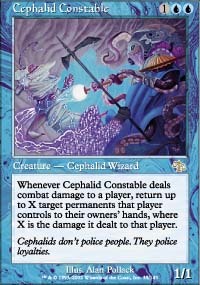 Whenever Cephalid Constable deals combat damage to a player, return up to X target permanents that player controls to their owner's hands, where X is the damage dealt to that player. Cephalid don"t police people. They police loyalties. 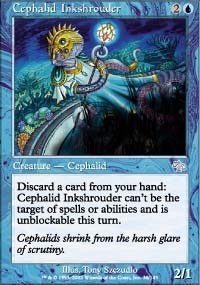 Discard a card from your hand: Cephalid Inkshrouder can't be the target of spells or abilities and is unblockable this turn. Cephalids shrink from the harsh glare of scrutiny. Choose an instant you own from outside the game, reveal that card, and put it into your hand. 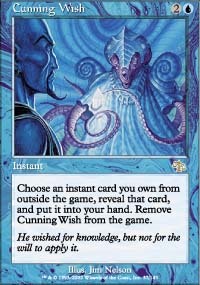 Remove Cunning Wish from the game. Magical or not, it is still a cloud. "What you made will be unmade. What you learned will be unlearned. And when you are done, you will be undone." Look at the top X cards of your library. Put one of them into your hand and the rest on the bottom of your library. 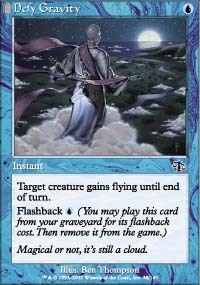 Flashback 1U, remove X blue cards in your graveyard from the game. 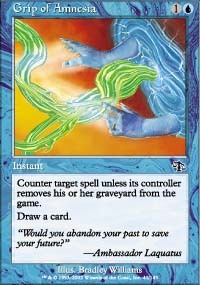 Counter Target spell unless its controller removes his or her graveyard from the game. 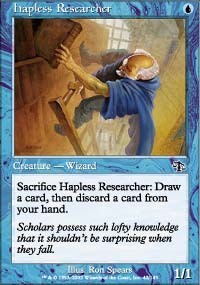 "Would you abandon your past to save your future""
Sacrifice Hapless Researcher: Draw a card, then discard a card from your hand. Scholars possess such lofty knowledge that it shouldn't be suprising when they fall. 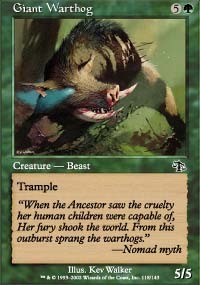 Draw a card from each attacking creature. "I see their moral dilemmas. I see their raw courage. I see their self-sacrifice. I see our victory." 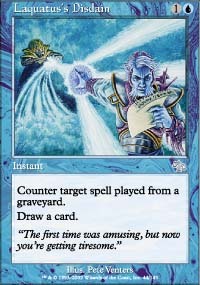 Counter target spell played from a graveyard. "The first time was amusing, but now you"re getting tiresome." 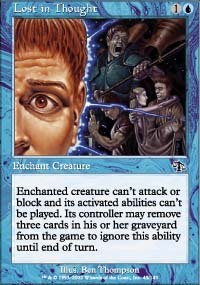 Enchated Creature can't attack or block and its activated abilites can't be played, Its controller may remove three cards in his or her graveyard from the game to ignore this ability unitl end of turn. Put the top two cards of your library into your graveyard. Some minds are more open than others. 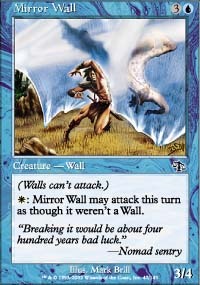 W: Mirror Wall may attack this turn as though it weren't a wall. "Breaking it would be about four hundred years bad luck." 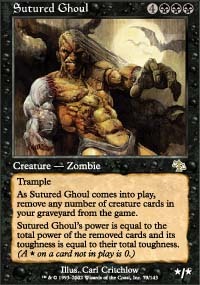 At the Beginning of each player's upkeep, that player untaps a permanent for each card in his or her graveyard. 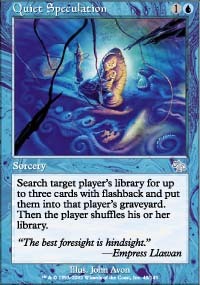 Search target player's Library for up to three cards with flashback and put them into that players graveyard. Then that player shuffles his or her library. 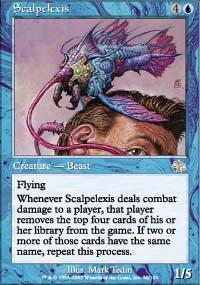 Whenever Scaplelexis deals combat damage to a player,that player removes the top four cards of his or her library from the game. If two or more of those cards have the same name, repeat this process. 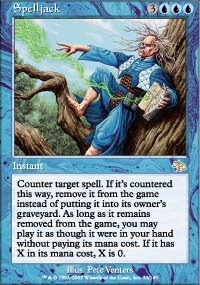 If the spell is countered in this way, remove it from the game instead of putting it into its owner's graveyard. 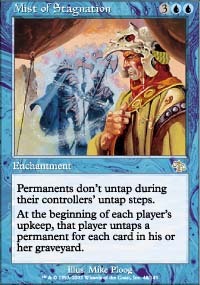 As long as it remains removed from game, you may play it as though it were in your hand without paying its mana cost. 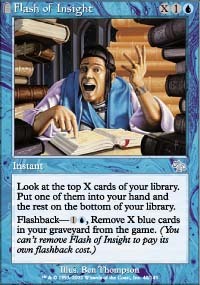 If it has X in its mana cost, X is 0. Whenever a player discards a card from his or her hand,you may pay 1U. If you do, tap or untap target permanent. "Nature"s been fired. The oceans are under new management." 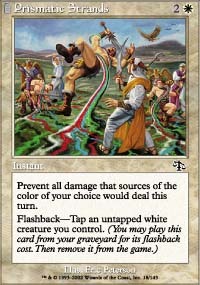 At the beginning of each opponent's combat phase, that player may remove a card in his or her graveyard from the game. If the player doesn't, creatures he or she control can't attack you this turn. Cephalids specialize in lose-lose situations. 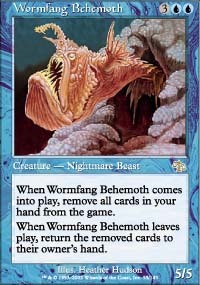 When Wormfang Behemoth comes into play, remove all cards in your hand from the game. 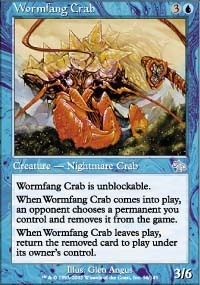 When Wormfang Crab this comes into play, an opponent choose a permanent you contol and removes it from the game. 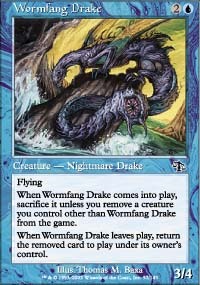 When Wormfang Crab leaves play, return the removed card to play under its ownder's control. 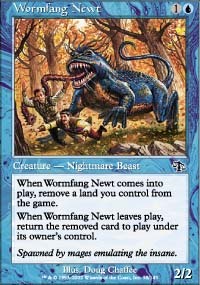 When Wormfang Newt comes into play, remove a land you control from the game. 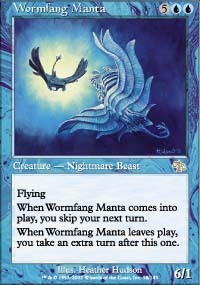 When Wormfang Newt leaves play, return the removed card to play under it's owner's control. Spawned by mages emulating the insane. 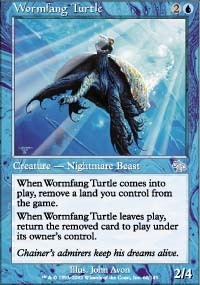 When Wormfang Turtle comes into play, remove a land you control from the game. 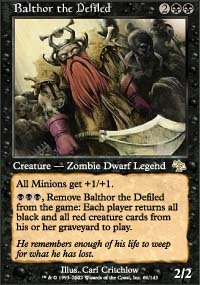 BBB, Remove Balthor the Defiled from the game: Each player returns all black and all red creature cards from his or her graveyard to play. He remembers enough of his life to weep for what he has lost. 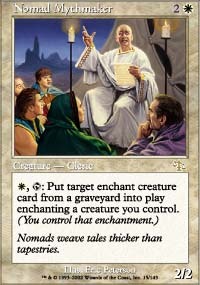 Name a nonland card. 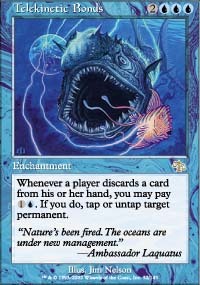 Target player reveals his or her hand and discards from it all cards with that name. 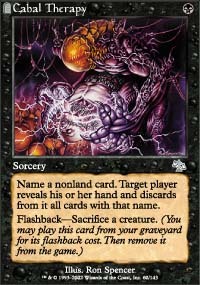 Flashback - Sacrifice a creature. 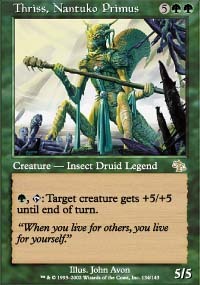 Sacrifice Cabal Trainee: Target creature gets -2/-0 until end of turn. Choose a card you own from outside the game and put it into your hand. You lose half your life, rounded up. Remove Death Wish from the game. He wished for power, but not for the longevity to abuse it. When Earsplitting Rats comes into play, each player discards a card from his or her hand. 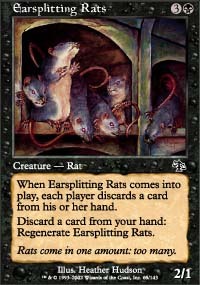 Discard a card from your hand: Regenerate Earsplitting Rats. Rats come in one amount: too many. 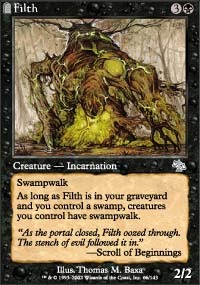 "As the portal closed, Filth oozed through. The stench of evil followed it in." 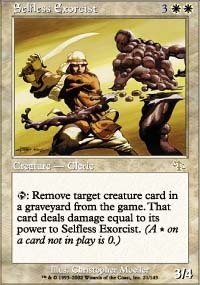 Each player may remove any number of cards in his or her graveyard from the game. 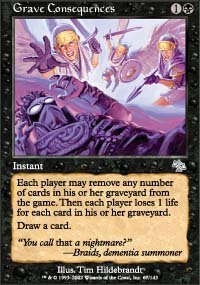 Then each player loses 1 life for each card in his or her graveyard. 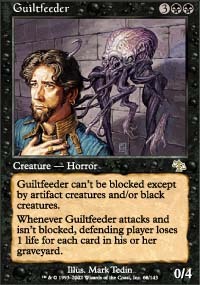 "You call that a nightmare""
Guiltfeeder can't be blocked except by artifact creatures and/or black creatures. Green creatures and white creatures have protection from Gorgons. 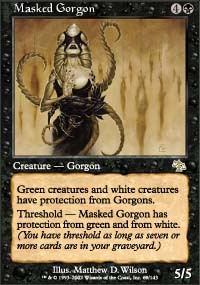 Threshold - Masked Gorgon has protection from green and from white. 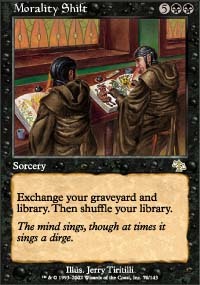 Exchange your graveyard and your library. Then shuffle your library. The mind sings, though at times it sings a dirge. Remove X target cards in a single graveyard from the game. "That does it- I quit!" 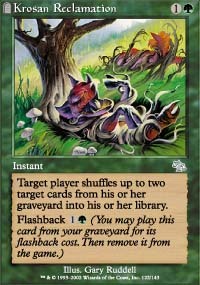 Threshold - Instead return that card from your graveyard to play. Target nonblack creature gets -1/-1 until end of turn. 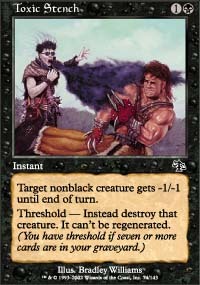 Threshold - Instead destroy that creature. It can't be regenerated. 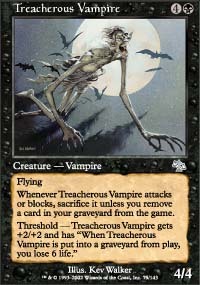 Threshold - Threacherous Vampire gets +2/+2 and has "When Treacherous Vampire is put into a graveyard from play, you lose 6 life." 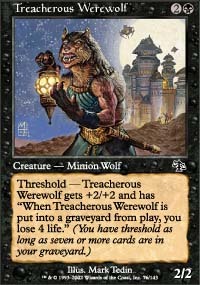 Threshold - Treacherous Werewolf gets +2/+2 and has "When Treacherous Werewolf is put into a graveyard from play, you lose 4 life." 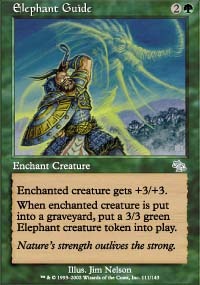 Enchanted creature gets +2/+2 and has "T: This deals one damage to target creature or player." Dwarves may teach at the speed of stone, but the results are solid. 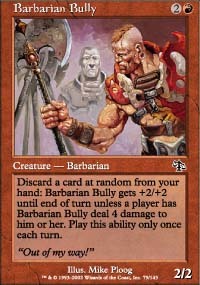 Discard a card at random from your hand: Barbarian Bully gets +2/+2 until end of turn unless a player has Barbarian Bully deal 4 damage to him or her. Play this ability only once each turn. 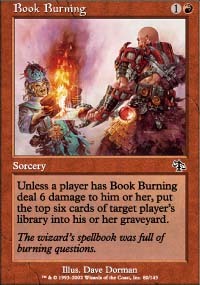 Unless a player has Book Burning deal 6 damage to him or her, put the top 6 cards of target player's library into his or her graveyard. 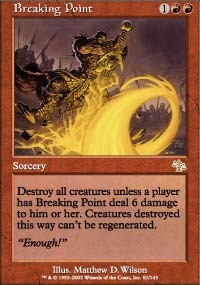 Destroy all creatures unless a player has Breaking Point deal 6 damage to him or her. Creatures destroyed this way can't be regenerated. 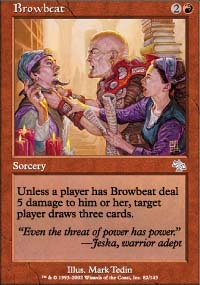 Unless a player has Browbeat deal 5 damage to him or her,target player draws three cards. 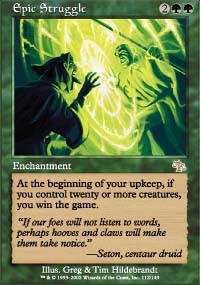 Choose a sorcery you own from outside the game, reveal that card, and put it into your hand. 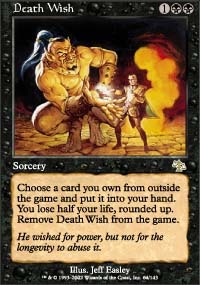 Remove Burning Wish from the game. 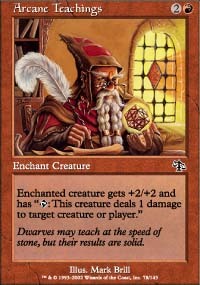 Tap an untapped Dwarf you control: Target creature gets+2/+0 until end of turn. 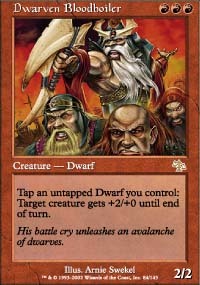 His battle cry unleashed an avalanche of dwarves. 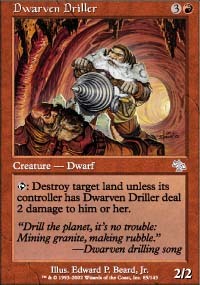 T: Destroy target land unless its controller has Dwarven Driller deal two damage to him or her. 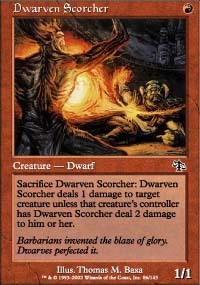 Sacrifice Dwarven Scorcher: Dwarven Scorcher deals 1 damage to target creature unless that creature's controller has Dwarven Scorcher deal 2 damage to him or her. Barbarians invented the blaze of glory. Dwarves protected it. 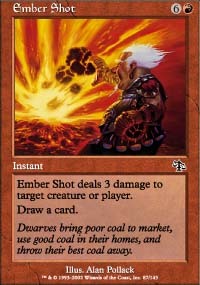 Ember Shot deals 3 damage to target creature or player. Dwarves bring poor coal to market, use good coal in their homes, and throw their best coal away. 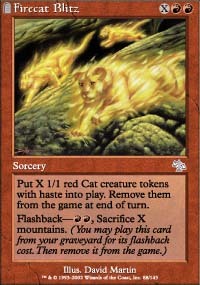 Put X 1/1 red Cat creature tokens with haste into play. 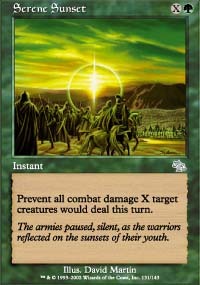 Remove them from the game at end of turn. 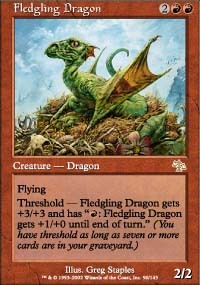 Threshold - Fledgling Dragon gets +3/+3 and has "R:Fledgling Dragon gets +1/+0 until end of turn." 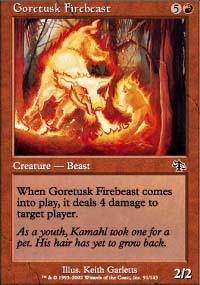 When Goretusk Firebeast comes into play, it deals 4 damage to target player. 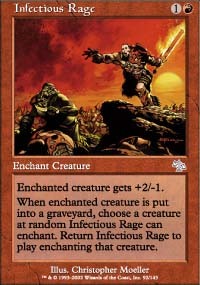 When enchanted creature is put into a graveyard, choose a creature at random Infectious Rage can enchant. 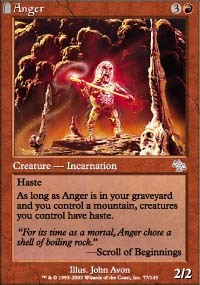 Return Infectious Rage to play enchanting that creature. 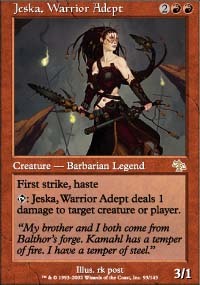 T: Jeska, Warrior Adept deals 1 damage to target creature or player. "My brother and I both some from Balthor's forge. Kamahl has a temper of fire. I have a temper of steel." 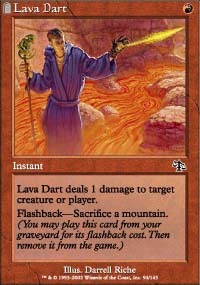 Lava Dart deals 1 damage to target creature or player. 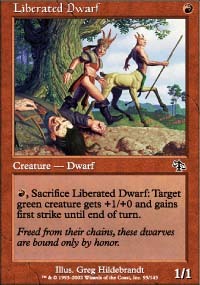 R, Sacrifice Librated Dwarf: Target green creature gets +1/+0 and gains first strike until end of turn. Freed from their chains, these dwarves are bound only by honor. 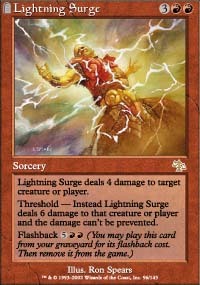 Lightning Surge deals 4 damage to target creature or player. 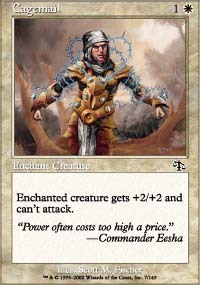 Threshold - Instead Lightning Surge deals 6 damage to that creature or player and the damage can't be prevented. 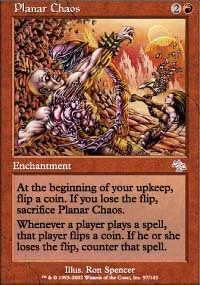 Whenever a player play a spell, that player flips a coin. If he or she loses the flip, counter that spell. 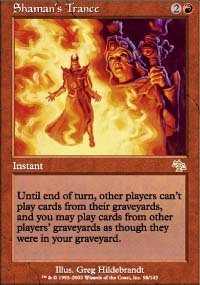 Until end of turn, other players can't play cards from their graveyards and you may play cards in other player's graveyards as though they were in your graveyard. Trample. 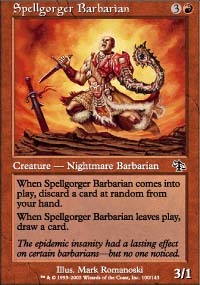 When Soulgorger Orgg comes into play, you lose all but 1 life. 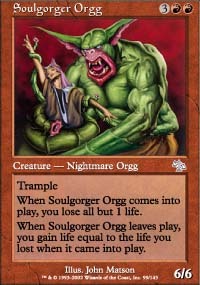 When Soulgorger Orgg leaves play, you gain life equal to the life you lost when Soulgorger Orgg came into play. When Spellgorger Barbarian comes into play, discard a card at random from your hand. When Spellgorger Barbarian leaves play, draw a card. The epidemic insanity had a lasting effect on certain barbarians- but no one noticed. 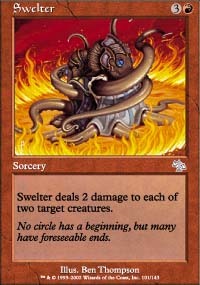 Swelter deals two damage to each of two target creatures. No circle has a beginning, but many have forseeable ends. 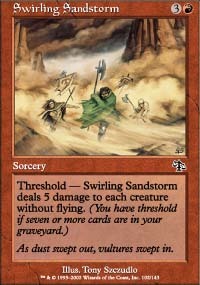 Threshold - Swirling Sandstorm deals 5 damage to each creature without flying. As dust swept out, vultures swept in. 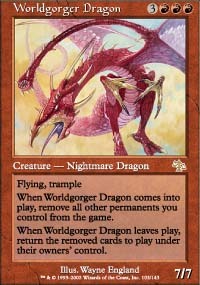 When Worldgorger Dragon leaves play, return the removed cards to play under their owner's control. 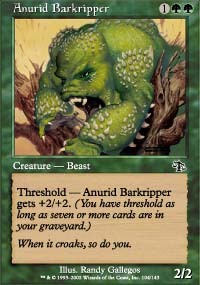 Threshold - Anurid Barkripper gets +2/+2. 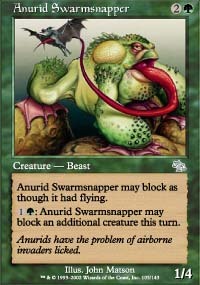 1G: Anurid Swarmsnapper may block an additional creature this turn. 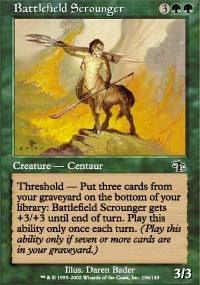 Threshold - Put three cards from your graveyard on the bottom of your library: Battlefield Scrounger gets gets+3/+3 until end of turn. Play this ability only once each turn. "'I have arrived', bellowed Brawn, and the plane shuddered." 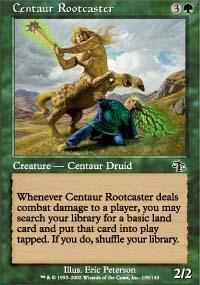 Whenever Centaur Rootcaster deals combat damage to a player, you may search your library for a basic land card and put that card into play tapped. If you do, shuffle your library. At the beginning of your upkeep, if you control twenty or more creatures, you win the game. 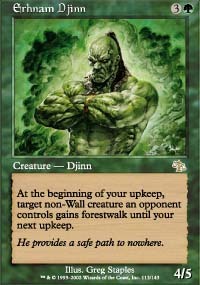 "If our foes will not listen to words, perhaps hooves and claws will make them take notice"
At the beginning of your upkeep, target non-Wall creature an opponent controls gains forestwalk until your next upkeep. 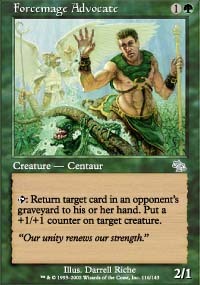 "We use only what we need - but in times of strife, our need becomes great"
You gain 1 life for each creature you control. Sometimes the healers need healing. 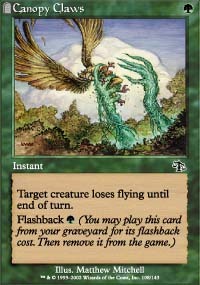 T: Return target card in an opponent's graveyard to his or her hand. Put a +1/+1 counter on target creature. 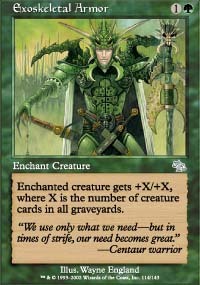 At the beginning of your upkeep, if Genesis is in your graveyard, you may pay 2G. 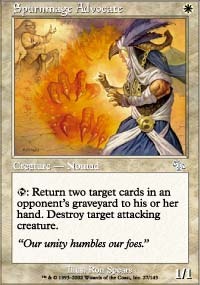 If you do, return target creature card from your graveyard to your hand. 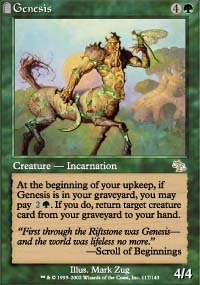 "First through the Riftsone was Genesis - and the world was lifeless no more." "When the Ancestor saw the cruelty her human children were capable of, Her fury shook the world. From this outburst sprang the warthogs." 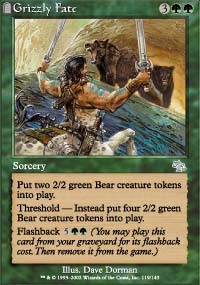 Put two 2/2 green Bear creature tokens into play. 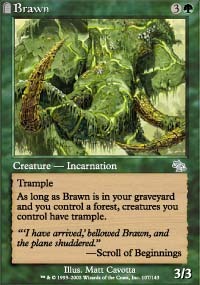 Threshold - Instead, put 4 2/2 green Bear creature tokens into play. 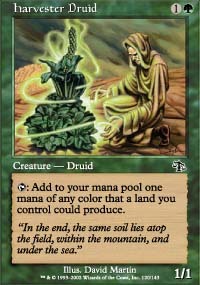 T: Add to your mana pool one mana of any color that a land you control could produce. "In the end, the same soil lies atop the field, within the mountain, and under the sea." 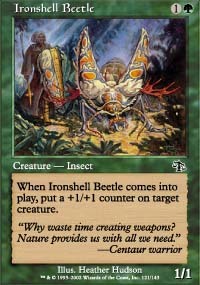 When Ironshell Beetle comes into play, put a +1/+1 counter on target creature. "Why waste time creating weapons? Nature provides us with all we need." 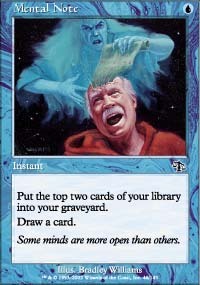 Target player shuffles up to two target cards from his or her graveyard into his or her library. 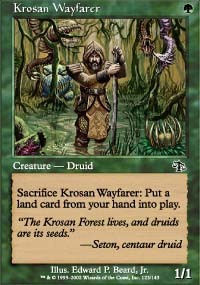 Sacrifice Krosan Wayfarer: Put a land card from your hand into play. "The Krosan forest lives, and druids are its seeds." 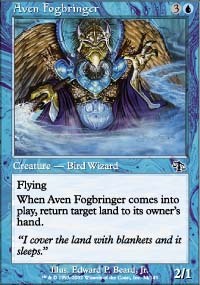 Choose a creature or land card you own from outside the game, reveal that card, and put it into your hand. 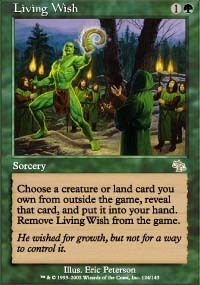 Remove Living Wish from the game. He wished for growth, but not for a way to control it. 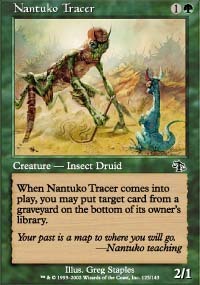 When Nantuko Tracer comes into play, you may put target card from a graveyard on the bottom of its owner's library. 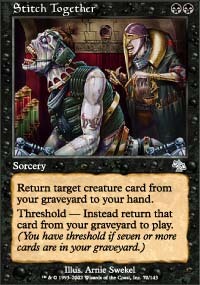 T: Return two target cards in an opponent's graveyard to his or her hand. Destroy target artifact or enchantment. "Our unity unmasks your deceit." Phantom Nantuko comes into play with two +1/+1 counters on it. 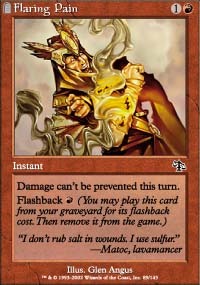 If damage would be dealt to Phantom Nantuko, prevent that damage. 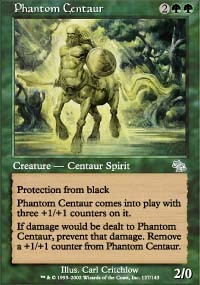 Remove a +1/+1 counter from Phantom Nantuko. 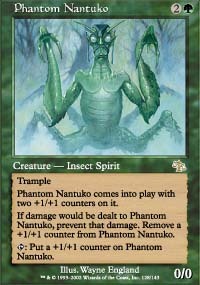 T: Put a +1/+1 counter on Phantom Nantuko. Phantom Tiger comes into play with two +1/+1 counters on it. 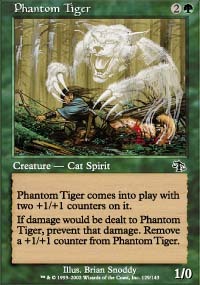 If damage would be dealt to Phantom Tiger, prevent that damage. 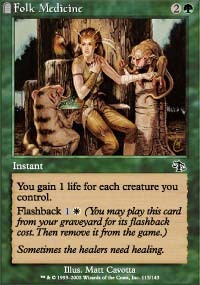 Remove a +1/+1 counter from Phantom Tiger. 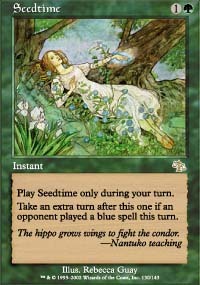 Play Seedtime only on your turn. The hippo grows wings to fight the condor. Target creature gets +3/+3 until end of turn. Draw a card. 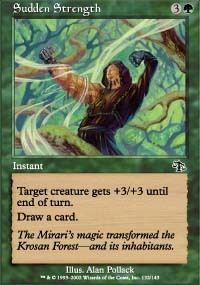 The Mirari's magic transformed the Krosan Forest - and its inhabitants. 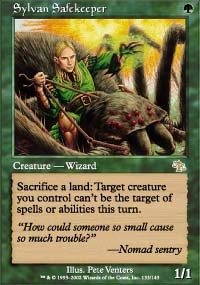 Sacrifice a land: Target creature you control can't be the target of spells or abilities until end of turn. "How could someone so small cause so much trouble?" G, T: Target creature gets +5/+5 until end of turn. 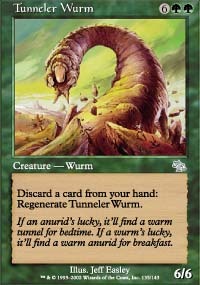 If an anurid's lucky, it'll find a warm tunnel for bedtime. 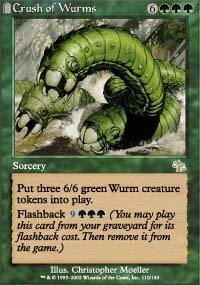 If a wurm's lucky, it'll find a warm anurid for breakfast. "True strength comes from within. 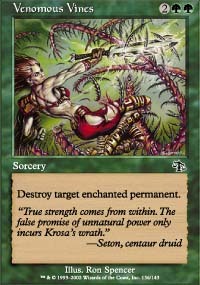 The false promis of unnatural power only incurs Krosa's wrath." 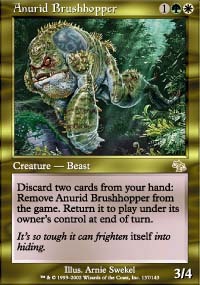 Discard two cards from your hand: Remove Anurid Brushhopper from the game. 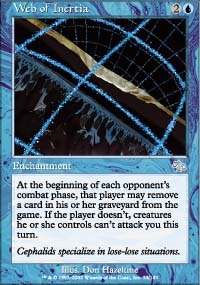 Return it to play under its owner's control at end of turn. It"s so tough it frightens itself into hiding. 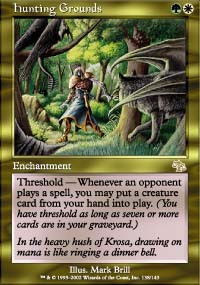 Threshold - Whenever an opponent plays a spell, you may put a creature card from your hand into play. 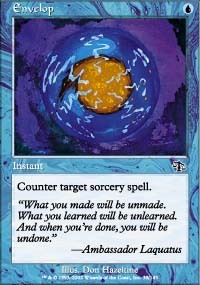 In the heavy hush of Krosa, drawing on mana is like ringing a dinner bell. 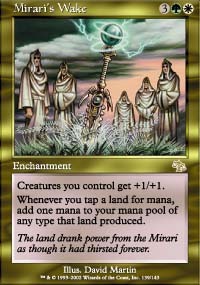 The land drank power from the Mirari as though it has thirsted for it forever. 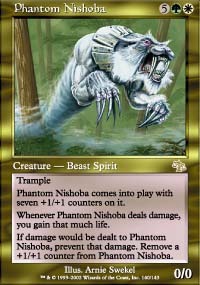 Whenever Phantom Nishoba deals damage, you gain that much life. Krosan Verge comes into play tapped. 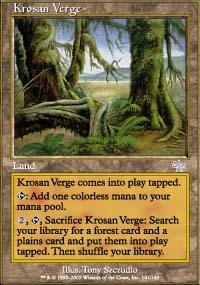 2, T, Sacrifice Krosan Verge: Search your library for a Forest card and a Plains card and put them into play tapped. Then shuffle your library. 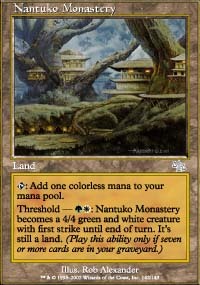 Threshold - GW: Nantuko Monastery becomes a 4/4 green and white creature with first strike until end of turn. It's still a land. 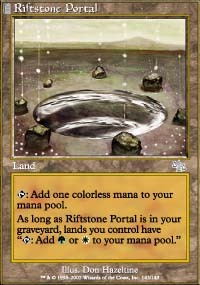 As long as Riftstone Portal is in your graveyard, lands you control have "T: Add G or W to your mana pool."